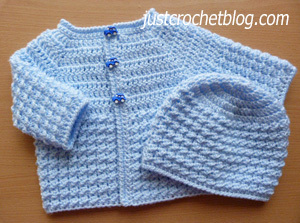 Crochet baby glitz coat-hat uk a free crochet pattern for a 16″ chest 0-3 month baby, made in a UK double knitting glitz yarn on 4.00mm and 4.50mm crochet hooks. Worked in one piece starting with the yoke. Commence Skirt – Change to 4.50mm hook, make 1ch, ss into base of 1ch, * 1tr into next tr, ss into next tr, * rpt from * to * to end. Turn. Next Row – 2ch, 1htr into base of 2ch, 1htr into each tr and ss to end. Turn. Pattern Row 1 – 1ch, ss into base of 1ch, * 1tr into next htr, ss into next htr, * rpt from * to * to end. Turn. Pattern Row 2 – 2ch, 1htr into base of 2ch, 1htr into each tr and ss to end. Turn. Rpt Pattern Rows 1 & 2 seven more times until 27 rows have been worked from beginning or work measures 9 inches from shoulder. Fasten off. Second Row – 1ch, ss into base of 1ch, 1tr into next tr, * ss into next tr, 1tr into next tr, * rpt from * to * to end, ss to first ss on beginning of row. Turn. Rpt Second & Third Rows 6 more times. DNT at the end of last row. Buttonhole Band – With WS facing, join yarn to lower edge of front edge, make 1ch, 1dc into base of 1ch, work 37 more dc evenly into row ends up first front, 3dc into corner, 1dc into each ch around neck edge to next corner, 3dc into corner, work 38dc evenly into row ends down second front edge to end. Turn. Buttonhole Row – 1ch, 1dc into base of 1ch, 1dc into each dc up first front, work 3dc into corner, 1dc into each dc around next, 1dc into corner, * make 2ch, miss 1dc, 1dc into next 7dc * rpt from * to * once, make 2ch, miss 1dc, 1dc into each of remaining dc to end. Next Row – Working into all dc and 2ch spaces work 1 row of crab stitch up first front, around neck and down second front. Fasten off. 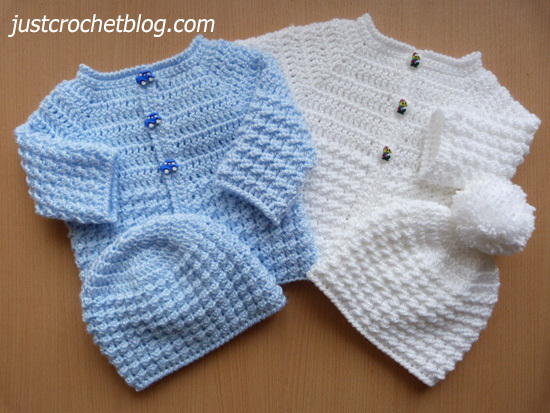 Finishing – Close small gap under arms, weave in any loose ends of yarn, attach buttons to correspond with buttonholes. Hat – Made in rounds without turning until the end of Row 5. Using 4.00mm hook make 6ch and join with a ss to form a ring, 3ch, work 13tr into ring, join with ss to top of 3ch on beginning of row. Row 6 – 1ch, * ss into next tr, 1tr into next tr, * rpt from * to * to end, ss to first ss on beginning of row. Turn. Row 8 – 1ch, ss into base of 1ch, 1tr into next htr, * ss into next htr, 1tr into next htr, * rpt from * to * to end, ss to first ss on beginning of row. Turn. Rpt Rows 7 & 8 six more times until 20 rows have been worked in all from beginning. Turn. Rpt Row 7. DNT at the end of last row. Work 1 row of Crab Stitch. 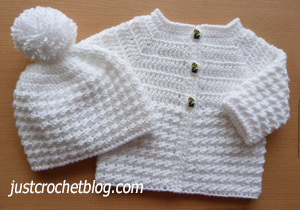 Hope you enjoy this free crochet baby glitz coat-hat uk pattern, don’t forget to pin!